Have you ever... Invested time in something that, with hindsight, just wasn't worth it? Overpaid in an Ebay auction? Continued doing something you knew was bad for you? Sold stocks too late, or too early? Taken credit for success, but blamed failure on external circumstances? Backed the wrong horse? These are examples of cognitive biases, simple errors we all make in our day-to-day thinking. But by knowing what they are and how to spot them, we can avoid them and make better choices - whether dealing with a personal problem or a business negotiation; trying to save money or make money; working out what we do or don't want in life, and how best to get it. Already an international bestseller, THE ART OF THINKING CLEARLY is essential reading for anyone with important decisions to make. It reveals, in 100 short chapters, the most common errors of judgement, and how to avoid them. 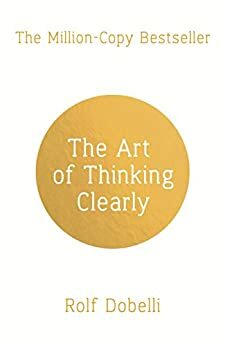 Simple, clear and always surprising, this indispensable book will change the way you think and transform your decision-making - at work, at home, every day. Switch back and forth between reading the Kindle book and listening to the Audible narration. Add narration for a reduced price of $9.99 after you buy the Kindle book. "Rolf Dobelli is endowed with both imagination and realism, a combination hard to find since the 16th century Renaissance." --Nassim Nicholas Taleb, author of the "New York Times Bestseller The Black Swan"
A fireworks show of insights into how our minds work. If you want to avoid tripping on cognitive errors, read this book. --Iris Bohnet, Professor and Academic Dean, Harvard Kennedy School, Director of the Harvard Decision Science Laboratory"
Dobelli examines our most common decision-making failings with engaging eloquence and describes how to counter them with instructive good sense. --Robert Cialdini, author of "Influence""
a serious examination of the faulty reasoning that leads to repeated mistakes by individuals, businesses, and nations In this fascinating book, Dobelli does not offer a recipe for happiness but a well-considered treatise on avoiding self-induced unhappiness. --Booklist (starred review)"
easy-going prose what [Dobelli] does is pinpoint exactly the assumptions, bias and illusions that shape our thinking and decision-making processes in both business and personal relationships that can cost us dearly as individuals and as a society. --Financial Times"
Already a huge bestseller in Europe, this is essential reading for anyone with important decisions to make, in the vein of THINKING, FAST AND SLOW and THE DECISION BOOK. 4.0 out of 5 starsNothing new but nicely collated. Very few of the ideas in this book are new or revolutionary, but the author does not pretend otherwise. It is very nice to have so many of the factors influencing thinking, collected and correlated into one book. It serves as a good reminder of these concepts or as an easy to read and accessible, introduction to critical thinking. The short single concept chapters make it easy to dip into and the use of anecdotes consolidates our understanding. Should be on everyone's bookshelf. It's a good quick read. Points you in the right direction. Allows you to find a particular area of the field that might interest you at a point in time, but would require further research elsewhere if you wished to analyse the topic in greater detail. life do not alter our level of happiness long term. If we do something right we take credit for it; if something goes wrong we blame every one else. It is an informative and enjoyable book to read. In the 1960s psychologists began to examine scientifically, how people think, decide and take action. The result, explains the author of this book, Rolf Dobelli, was a “theory of irrationality that states: thinking is in itself not pure, but prone to error.” This, they found, was true of all people, including the highly intelligent, resulting in everyone falling into the same cognitive errors. More interestingly, it appears we all “systematically err in the same direction.” If this is indeed true, it means we all make predictable mistakes. If it is true, and it appears to be, we should be able to fix at least some of them and avoid making these errors in our lives. This book is a useful compendium of error. Reading this book will certainly increase one’s awareness of possible errors, which will lead to better decisions. To illustrate, I have chosen five errors of the Dobelli’s 99. You are roaming the Serengeti some 50,000 years ago, and your hunter-gather companions suddenly break into a desperate run away from some disturbance. What should you do? Mindlessly follow, or consider the possibility that it is a gazelle rather than a predator. Having seen a thoughtful companion become some animal’s lunch you run with the crowd. “Social proof” is the legacy of this herd instinct that dictates that individuals are behaving correctly when they act the same as other people. Social proof is behind stock market bubbles, as well as stock market stampedes. It is no different in the worlds of fashion, management techniques, and diets. Social proof informs even simple decision such as selecting a restaurant in an area with which you are unfamiliar. It seems sensible to choose the one that is full over a poorly patronised one. The film was awful. After an hour, Dobelli whispered to his wife: ‘Come on, let’s go home.’ She replied : ‘No way. We’re not throwing away $ 30.’ The $ 30 is not reason to stay, that would be a thinking error. The money was been spent, and will not be returned. This is an example of the sunk cost error. So often in business, there is the sense that having invested so much, it would be wrong to stop now. Stopping now, makes the investment seem a mistake. The sunk cost fallacy is most dangerous when we have invested time, money, energy, commitment or love in something. The need for consistency drives this type of irrational behaviour. Deciding to cancel the project before it is completed is to admit that we had made a mistake. Psychologist Robert Cialdini has studied the phenomenon of reciprocity and concluded that people have discomfort feeling they are indebted to another person. This phenomenon has a long history. When primitive man’s food supplies were subject to high fluctuations, he needed others to share their food with him. When he killed an animal too large to eat in one day, he would share the meat with others in his group. Doing this would ensure that they share their meat with him when he is short. When approached in the supermarket, with an offer of a taste of wine, a chunk of cheese or a handful of olives, Dobelli advises to refuse the offer. The error of reciprocity has led many to ending up a pantry full of goods they do not even like. We judge something to be beautiful, expensive or large only if we have something ugly, cheap or small to compare it to. Experiments indicate that people will walk an extra ten minutes to save $ 10 on food. The same people, however would not walk ten minutes to save $ 10 on a $ 1,000 suit. The whole category of discount business is only viable because of this error, Dobelli claims. In the investment arena, the error leads people to believe a share is good value because it is 50% below the peak price. The share price is what it is, and comparison is irrelevant. All that matters is whether the share goes up or down in the future. The contrast effect also plays out in the social arena. If you are dating it is not prudent to double date with your supermodel friend. This makes you appear less attractive than you really are! It is so easy to not confuse the company spokesperson, the newscaster, and the cliché generator with those who possess true knowledge. You can recognize the difference because the true experts know what they know and what they do not know. This book is a “must read!” We cannot do enough to protect ourselves from our thinking errors and the author sites 99 such errors. Much of the material in this book can be found scattered elsewhere. The value of this book is that the information is in one place. *Ian Mann of Gateways consults internationally on leadership and strategy and is the author of Strategy that Works. 54 people found this helpful. Each chapter was clear and concise in pointing out fallacies and errors in thinking, that if headed, would prevent a lot of mistakes, heartache and errors. It has just enough examples and explanations to become clear or are reminded of biases, fallacies and lazy thinking. It ought to be mandatory reading. If more people were clear about how they make decisions, adopt opinions or embrace beliefs, the more thoughtful and rational our society would be. I love the book and have given it as gifts several times. I wish he would have his 2nd book translated into English too so I could give it as gifts also. I read Nassim Taleb's Fooled By Randomness and then started reading this book. It felt like deja vu in the first few chapters since so much content has been lifted directly from FBR. I didn't do word-for-word comparisons, but others have. The plagiarism was so strong, I had to go research it to make sure I wasn't fooling myself. Sure enough, Dobelli has been outed as a plagiarist. I got through 30 chapters or so before I started feeling too guilty to continue. I can't even recommend this if you want a cliff notes version of Taleb, Ariely, Kahneman, et. al. Just read the originals. They go way more in-depth and properly reference the work of others. 53 people found this helpful. Is this an art? I mean, thinking clearly? Having read a lot on the subject and trying to be as cold headed as possible on most situations, I concluded that the most important thing you can do, if not in real danger, is not to take decisions in a rush. Take your time and think it over. Good thinking takes time. Ponder. We have a lot of automatic responses in our brian cells and that is not always good...! That is why a book like this one becomes useful. You will find lots of examples of mental errors that we all commit almost daily and mostly for the benefit of others. And later, this hurts. You remember those logic fallacies we learned in school-- after this doesn't necessarily mean because of this, don't argue in a circle, don't set up a straw man just to knock it down, don't fall for either this or that . . . . This book covers about 80 more of those, devoting several pages to each, with interesting real-life examples. Much better handled than the way it was presented to us in school.